Yesterday at work someone had left a strange little still-life set up on a table in the ladies restroom: a little cosmetic bag and a a heavy metal box cutter (well, to me it looked like a still life, probably nobody else would have thought so). 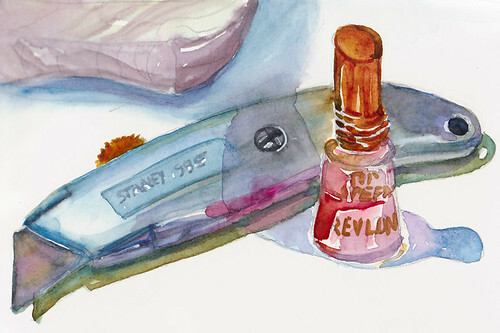 I recreated it on my drawing table tonight, adding a bottle of nail polish that I keep in a similar cosmetic bag. I like the way the box cutter came out looking like a fish with a little rooster comb on top (the brass thingee you push to move the blade in and out). It felt so good to do this painting after a frustrating day in which I never made it out of my pajamas. Fridays I work half a day from home, but today the half day stretched out into the late afternoon, due to problems needing my attention and because I got a late start due to spending a frustrating hour trying to reassemble my wonderful Capresso coffee grinder after finally receiving the missing part in the mail (it had fallen on the floor when I cleaned the grinder, and was promptly stolen and hidden by my plastic-gizmo loving calico cat Fiona). It turns out I’d put the burr grinder piece in wrong and it was jammed and I could not remove it and so the bean hopper wouldn’t screw back in on top. Now the whole thing needs to go back to Capresso for repair. Makes me think it’s time to give up coffee (again!). It was the first sunny day in a long time and I wanted to get outdoors and paint…and I needed to get some exercise…and I had some errands and phone calls to make. Plus I had a bunch of studio art projects I wanted to do — some dream paintings, color exercises, and this one. I got into one of those stuck places, going around in circles…I’ll go to the gym first, no to the store first, no outside to paint first, but really I should vacuum…I’ll just check my email….and around and around. I call it Hamster Brain, since it feels like running in one of those hamster wheels. Finally, at 8:00 P.M. I pulled myself out of it, did about half an hour of Pilates (while simultaneously putting in my weekly call to my mother) and having accomplished both those things, got to my drawing table and made this picture. Now it’s 11:00 p.m. and I’m free! My weekend has begun and it will joyfully include exercise, painting, and as little erranding and hamstering as possible! Glad “hamster brain” (Great concept!) ended and we get to see your fun watercolor painting. Have a great weekend. GOOD for you — exercise, chores AND getting a painting done — lovely, by the way — and such a juxtaposition — the feminine polish against the blade! LOL I hate days when my mind spins like that — but I’m delighted that you worked your way to weekend freedom!!! I’m so glad you’re back from your computer hiatus! I smiled at your “well, to me it looked like a still life, probably nobody else would have thought so.” My life is full of those little moments, too. I know all of your other artist friends would chime in here in recognition, too! This is wonderful—cool blues, grays, and cool reds except for the bottle top and the rooster’s comb. So very you. Oh, the good old Stanley knife. We used to use them for cutting stencils for screen printing. What an odd grouping of objects. Maybe you could write a short story using those objects! I’ve tried my hand at writing fiction and I wasn’t any good at it though I do like writing in general. Wonderful still life, beautifully executed … the colors are so perfect together. Hi, one of my students loves your site and sent me the link to this little study because I suffer from Hamster Brain most days (four kids, work, blah-blah-blah). You are a delightful painter; she’s sent me links to several other things you’ve done. I love the incongruity of this study. It reminds me of cleaning out my purse. Sorry about your grinder, sounds like and exercise in frustration! Love this little still life, great colors! Hope you have a fun relaxing weekend with no hamster brain! The most beautiful cutter watercolour I’ve ever seen! Ha! Thanks for the laugh! Spoken like a true coffee addict! Oh yes! Hamster Brain has also migrated to my place. And trust an artistic eye to see a picture in a Stanley knife. So very Jana. What a delightful painting, and beautifully executed. Yes, I see the fish, all sleek and silvery, snuggled up to that magnetic red nail polish. You have verbalized that common condition perfectly, and I too, shall hereby dub it “hamster brain syndrome.” You write so well, it’s a pleasure to read the accounts of even your worst days. So thanks for sharing it all with us! Thanks everyone for your wonderful comments. It made the funky day worth it. I love all your work but I must say your watercolours captivate me. The simpliest of objects are turned into such beauty. I wish I lived closer and I could take lessons!!! You are such an inspiration! I love the yin/yang balance to this piece. Great idea for a still life.